In October, when news arrived that a new project featuring Mem V. Stein (Exumer) and Tatsu Mikami (Church Of Misery) had formed under the moniker of SKULL PIT, it immediately piqued my interest. There was only stylistic speculation at the time, guesswork about what the collaboration’s output might sound like, yet soon that initial revelation was followed by the official video for the track “Fire Breather“. Of course, there was no longer a need to ponder or surmise, as people learned that SKULL PIT was indeed a damned heavy metal band. If there was even a modicum of uncertainty about that, any doubts have now been completely obliterated with the unleashing of the self-titled, full-length SKULL PIT début that arrived from Metal Blade Records on November 16th. Upon it are ten searing salvos of unbridled, furiously discharged, aural savagery presented behind the guise of songs and served with a total lack of temperance. When you hit play on this album, it’s an act that is the symbolic equivalent of igniting a fast burning fuse, as the incendiary blues of “Double Cross” smolders away. The song coils itself around you like some slithering serpent of a most steely nature, winding its way about you with an ever-tightening constriction, while a venomous vocal provides the narrative of your demise. It provides the perfect set up for second cut “Roller“, a fuel injected dragster running on whiplash-inducing riffs and rapid fire rhythms that careen like some off-the-rails locomotive. At certain points along the way, it feels as if things are reaching a nearly neck-breaking velocity, an aspect that shall remain for the duration of the album. See, SKULL PIT seemingly have no abstemious govern to regulate their advance. There is no tamping them down, nor taming them musically. Screw that! Songs like the aforementioned “Fire Breather“, or ones like “Soul Raiders“, “Marauders“, or “The Line“, possess inspirational origins derived from the likes of Motörhead, Venom, or countless NWOBHM acts like Raven, Vardis, or Savage. 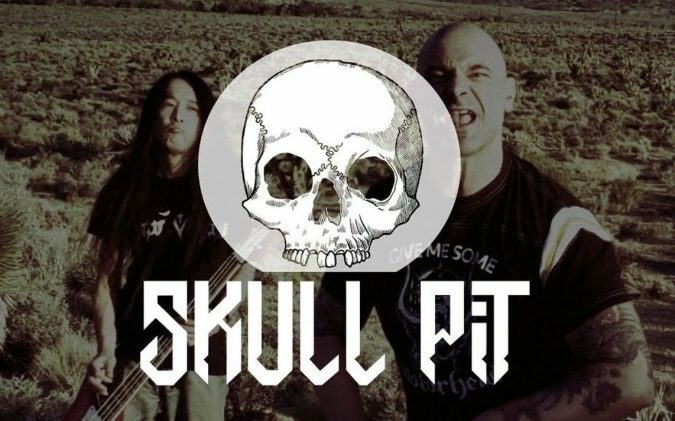 SKULL PIT provide an interconnecting bridge between the classic metal past, the old-school, if you will, and a fixed anchor footing in the modern era. Riveted with nuances of a vintage caliber, yet executing their emissions with acerbically caustic substance, this is lethal audio for those with a fearless soul. You dogs of war take heed, hearken quickly, and recognize two of this album’s particular stand-outs, which, ironically, relate to packs both canine and lupine. The densely smoldering, groove infused “Year Of The Dog“, as well as the spiraling sonic free-for-all that is “Wolf Spirit“, provide some of the finest, most definitive moments for SKULL PIT. Also, I would be shamefully amiss if I didn’t mention the album closing bonus track, a respectable rendering of the Rose Tattoo rocker, “All The Lessons“, featuring a guest cameo from ex-Madball guitarist Brian “Mitts” Daniels. Make no mistake, there is indeed a number of reaffirming lessons to be culled from this concrete-like slab of unrelenting stone and steel. It is up to the individual to determine what they are for themselves, I just know that I derived an unshakable certainty that heavy metal is both alive and well, and thriving as long as we have acts like SKULL PIT brandishing the banner. Stream the SKULL PIT self-titled album above in this review or crusade your way over to Bandcamp for further streaming and purchase options HERE.